Chakras are nuclei of vibrating spinning etheric energy substance of light and sound currents. No. 1 the tisra till [tisra til] center or the Ajana [Ajna] chakra is the mysterious third eye. This center is the meeting place of soul and mind energy in its descent into the body. It is the Gordian Knot of life where the conscious currents and the unconscious impulses meet. Here is the Armageddon of the soul for control of the direction of energy upward as the path of virtue and liberation or downward and outward for further involution into the snares of matter and self satisfaction. It is the mind center of thought control. The sun and moon energy as positive and negative cosmic breath energy crosses over in the center of each chakra as the individualized life breath. As the sun and moon travel constantly so does the breath supply all cells in its rhythmic flow. The central core energy moves by polarization from plus to minus. The surface circulation is through radiation like atomic heat waves. This exhausts itself unless it is sustained from the central core as the tree of life in each section or oval. No. 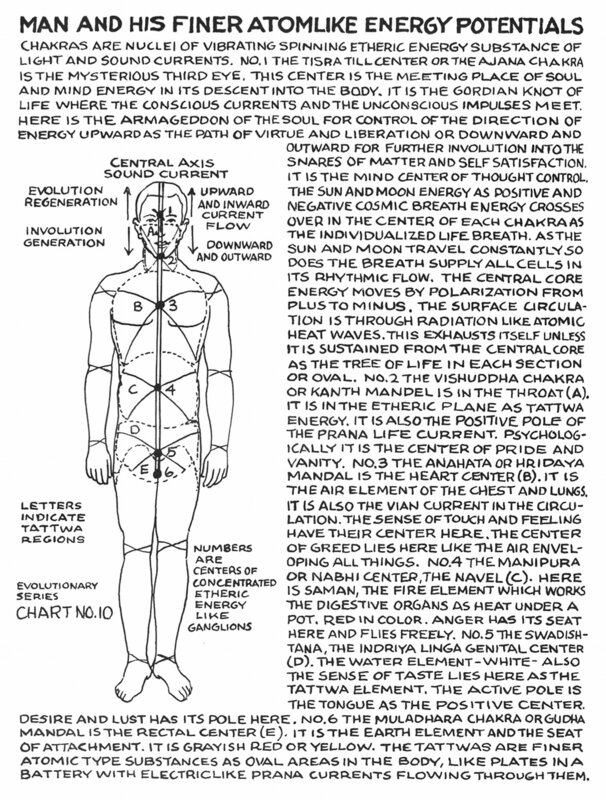 2 the Vishuddha [Vishuddhi] chakra or kanth mandel is in the throat (A). It is in the etheric plane as tattwa [tattva] energy. It is also the positive pole of the prana life current. Psychologically it is the center of pride and vanity. No. 3 the Anahata or hridaya [hrit] mandal is the heart center (B). It is the air element of the chest and lungs. It is also the vian current in the circulation. The sense of touch and feeling have their center here. The center of greed lies here like the air enveloping all things. No. 4 the Manipura or Nabhi center, the navel (C). Here is saman, the fire element which works the digestive organs as heat under a pot. Red in color. Anger has its seat here and flies freely. No. 5 the Swadishtana [Swadhisthana], the indriya linga [lingam] genital center (D). The water element - white - also the sense of taste lies here as the tattwa [tattva] element. The active pole is the tongue as the positive center. Desire and lust has its pole here. No. 6 the Muladhara chakra or gudha mandal is the rectal center (E). It is the earth element and the seat of attachment. It is grayish red or yellow. 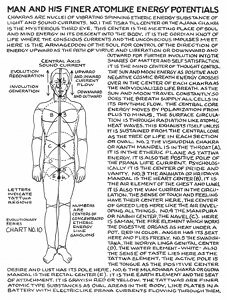 The tattwas [tattvas] are finer atomic type substances as oval areas in the body, like plates in a battery with electriclike [electric-like] prana currents flowing through them.